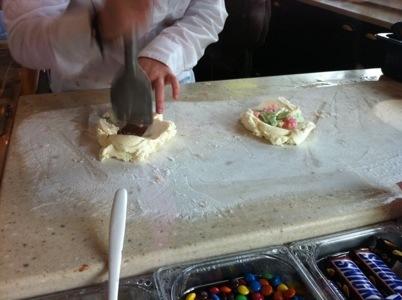 In the US we loved the ice cream parlor Cold Stone where you picked an ice cream flavor and different types of toppings. 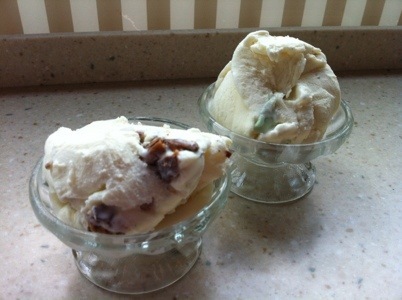 My favorite were vanilla ice cream with brownie, marshmallows and hot fudge. During the past years this seems to have become popular in Sweden as well. Tonight we went to Bogart’s which is located around 5 minutes by car from where we live. We bought one scoop with vanilla with Daim (crispy toffee type of candy bar), and another with Ahlgren’s bilar (marshmallow candy). Yummy, yummy, yummy!